South Africa 6-230 (Colin Ingram 73, David Miller 38, Dwayne Bravo 2-43) tied with West Indies 6-190 (Marlon Samuels 48, Chris Gayle 36, Dale Steyn 2-33) Duckworth/Lewis Method. The Proteas smashed 230 for the loss of six wickets in 31 overs and the Windies managed 190 with four wickets remaining after 26.1 overs. 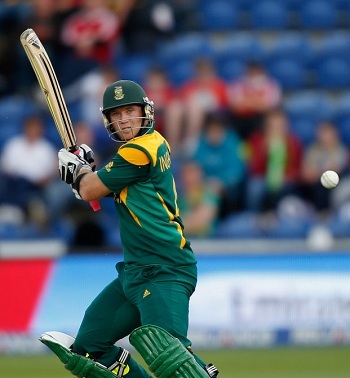 Colin Ingram (South Africa) was declared ‘Player of the match’ for his attacking knock of 73 top at the order. The 9th match of the ICC Champions Trophy was played on Friday, June 14, 2013, at Sophia Gardens, Cardiff. The match was reduced to 31 overs a side after rain interrupted the game. Earlier, Dwayne Bravo, the skipper of West Indies, won the toss and preferred to chase. Colin Ingram and Hashim Amla got off slowly by scoring 38 runs in 7 overs with 3 fours when Ingram hit the first six in the next over. Ingram reached his third ODI fifty in the 12th over with 1 six and 1 four as Amla was caught by Chris Gayle off Marlon Samuels for 23. The first wicket fell at 80 as the captain of the Proteas, AB de Villiers, walked in next as Ingram was dropped at 63 in the 15th over. AB de Villiers was doing well by hitting regular boundaries as Colin Ingram was gone for 73 off 83 balls with 2 lofty sixes and 6 fours at 124 in 17.3 overs. The next wicket was lost four overs later as Faf du Plessis walked in the park next. The batsmen were marching slowly as de Villiers became the next victim for 37 and was replaced by David Miller. Faf du Plessis along with Miller picked up the run rate as the latter was the most aggressive of the two and hit 3 sixes until the 31st over. Faf du Plessis was run out for 35 and Miller scored 38 off 29 with 3 big sixes and 1 four as South Africa managed 230 with four wickets in hand after 31 overs. Dwayne Bravo was the top wicket taker with two whereas Ravi Rampaul, Marlon Samuels and Kieron Pollard shared one wicket each. 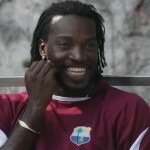 West Indies opened up with Chris Gayle along with Johnson Charles in a slow mode as well and picked 35 in 7 overs. Charles became the first victim for 16 as Darren Smith took guards next with Gayle and added 17 runs in the 11th over with 1 six and 2 fours. Gayle was caught by du Plessis at point off Chris Morris for 36 off 27 with 1 six and 5 fours as the total touched 75 in 11.5 overs. Darren Smith followed him 12 runs later for 30 as Marlon Samuels and Dwayne Smith tried to keep the pressure on the rival team. Bravo hit 2 fours in the 16th over but ran himself out for 12 as Kieron Pollard associated with Samuels. Marlon Samuels opened up by dispatching 16 runs in the 20th over with 1 six and 2 fours as clouds covered the sky above the field again. Samuels hit an even number of boundaries in the next over as Pollard got a couple of fours two overs later. Marlon Samuels was clean bowled by Dale Steyn for 48 off 38 deliveries with 2 giant sixes and 6 fours. Dwayne Bravo got together with Pollard who was caught by Steyn at long off at the bowling of Ryan McLaren for 28 off 23 with 5 fours. 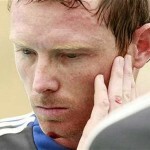 The Windies scored 6-190 in 26.1 overs as rain interrupted the match again, which was stopped at that point. The crucial wicket of Kieron Pollard let them down as they required exact 190 runs after losing six wickets in 26.1 overs according to D/L method. Dale Steyn was the supreme bowler with two wickets whereas Chris Morris, Robin Peterson and Ryan McLaren claimed one wicket each. The important encounter for both teams ended as tied and both sides shared one point each. South Africa achieved a net run rate of +0.325 and rushed into the semi-finals as compared to -0.075 held by West Indies.